Multi Commander 8.0.0.2450 Portable » TopFreeSoft.Net - Best Freeware Software! Find opened/locked files. Find which process has a specific file open. Show folder sizes in the filesystem browser. Rename multiple files by replacing substrings in the name. Disconnect a USB or remote device from within Multi Commander. Browse the Windows Registry as a filesystem. Show file properties as columns. Unpack archives into individual folders. Pack folders into individual files. Convert text files to/from Unix/Windows/Mac formats. Wizard to help create Junctions\Symlinks\Hardlinks. Convert pictures to JPEG, PNG or BMP. Auto-rotate pictures according to EXIF information. Strip EXIF information from pictures. 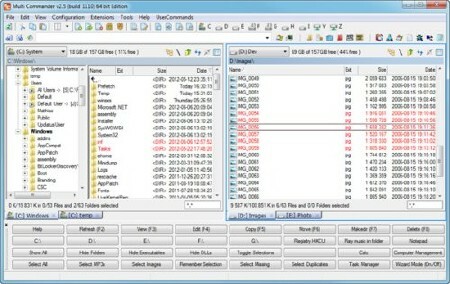 Export EXIF information from pictures to text file. GPS EXIF column is clickable and will show location in Google maps. Show movie Information like rating, genre (and more) as columns for movie files. Get movie Information from IMDB and RottenTomatoes. Search by file contents, file attributes, file size, file time. Minimize your search result by searching within the results. Verify .SFV (CRC32), MD5 files.